When I started buying organic & eco friendly products about 5 years ago, my household expenses definitely went up. However, I hardly gave it a second thought. The economy was great, we had everything we needed & then some, & the research I was doing was compelling enough to convince me that organic was the way to go, so I simply rolled with it. Fast forward to 2009. The economy had taken a toll on my family & I needed to scale my budget back. I wasn’t willing to give up purchasing organic & green products, so I had to figure out a way to pay less for what I needed to buy (sound familiar?). It took some trial & error, but I was able to drop our grocery budget by 25-40% while still buying the same brands I had previously been paying full price for. If you would like to start purchasing more organic & green items in the New Year, don’t be afraid to do so. There are ways to save on organic & eco friendly products. Always take a walk through the organic section of your store. Keep an eye out for peelies, blinkies, tear pads, etc. Fred Meyer & QFC both put out a magazine that has great coupons for organic products. Grab one & build your coupon stash. Check the website of every product that you like or want to try. Seventh Generation, Organic Valley, Earth’s Best, & many more have coupons you can download. Sign up for any newsletters they offer which often include coupons as well. Pay attention to coupons for non organic items. Many brands offer both organic & non organic products. Unless a coupon specifically excludes the organic variety, you can use it on the organic product. For example, if you see a coupon for $.50 off any Newman’s Own pasta sauce, use it on their organic variety. Shop Trader Joe’s. Most of their items are their own brand, but if they carry a brand name product, they will accept a coupon for it. Shop Costco. Costco is always stocking more organic & eco friendly items. Shop online. Amazon, Drugstore.com, & Alice.com all have amazing selections of organic or green products & often have great deals. Take advantage of those stock up prices! In October of 2009 I bought enough organic tampons & pantiliners to last me over a year & spent around $50 doing so. I still haven’t run out! I’m going to contradict myself, but shop locally. This will reduce your carbon footprint & get you fresher products. Plus, you will be supporting your local economy. Weather permitting, shop farmer’s markets. Buy directly from a farmer & buy in bulk. You will pay more up front for a quarter of a cow but it will likely save you in the long run. Join a CSA (community supported agriculture) & get fresh produce right from the farm. Some CSA’s will let you pick your items, while others simply send you a selection of what’s ripe at the time. Purchasing organic & eco friendly products costs more; there’s no denying that. However, by using your savvy shopping skills, the impact on your budget will be minimal. If you have any other tips, please share them with us! If you have any questions, please leave a comment & I’ll do my best to get back to you in a timely manner. Heather is the author of Because More Is More. She is passionate about living a greener lifestyle & strives to educate her readers about it while maintaining a sense of humor. Heather lives in Snohomish County, Washington, with her husband & 6 year old daughter. I find a lot of times when I shop at Fred Meyer there is at least one type of organic produce that is the same price or cheaper than the non-organic variety, especially with apples I have found this fall. A GREAT place to get local and organic is spud.com. use code CRSEA-DEVANI to save $25 on your first 4 deliveries. We just love it. Free delivery over $33. Awesome customer service and easy to use website to order. Check out my site, http://www.spudcouponcode.com to learn more about it! They even tell you how much you have reduced your carbon footprint. A great way to spend more time with your kids and less time at the store. This is great! Thank you! I just was lecturing all my mom clients about the importance of buying organic. It’s so important! Can definitely hurt the wallet, though. These tips are really helpful. 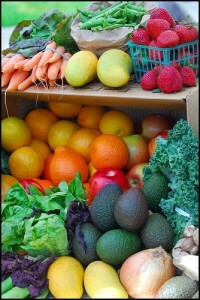 Here’s a blog post on what produce items are most important to buy organic: https://www.fithealthymoms.com/2010/12/21/your-dirty-dozen-and-clean-15-print-this/. I was so glad to read that you were having a post done on this. Truly a passion of ours and I really appreciate all her advice. One thing I would add, is to grow some of your own. :-) I’ve just started some breakfast radishes downstairs in a sunny window. Completely edible and fast, which if you have kids, fast is a good thing. They can see what happens and experience it fresh, quickly. More and more folks are getting backyard chickens too. They are fun & educational, plus give amazing eggs. So good in fact, that you will seriously pass up eggs when they are 99 cents a dozen. Corinne, great tips. Last week I had a deal on my blog for $25 in credit to a gardening supply site. They had tons of organic options! I have a black thumb but I think I may try a garden this year. Thanks for the tips and here is one of my own, Also if you want to tryout a new organic product or are a loyal customer you can contact the company and tell them and most will send coupons. You’re right, Katie, that is a great way to find extra coupons, esp for those companies that are harder to find coupons for.